Monrovia, Liberia - The President of the Republic, H.E. 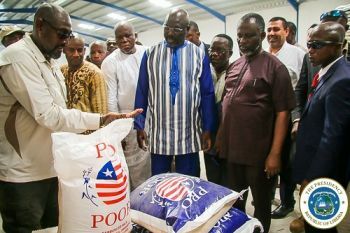 George Manneh Weah says agriculture has got no substitute in national efforts to obtaining food security and maintaining a healthy population. He said food production towards self-sufficiency is a centerpiece of his government’s Pro-Poor Agenda for Prosperity and Development and he would leave no stone unturned to achieve this goal. He said making rice, also known as political commodity in Liberia, available and affordable for the people of Liberia is the preoccupation of his Government and this will be achieved to help reduce the high cost of the country’s staple. “I am happy for the supply of the Pro-poor Rice on the market,” he said. “We all know rice is very important for our people as it is the stable food. We will do our best to always have it on the market and sold for a price that our people can afford”.